National Geographic reports that 40 percent of adults in the United States are sleep deprived. In today’s constantly on-the-go society, getting enough sleep can be hard. If you suffer from cluster headaches, getting the right amount of sleep can be even harder. If you frequently wake up in the middle of the night with a painful headache behind your eye, it could be caused by cluster headaches. Don’t let headaches behind your eyes keep you from getting an adequate amount of sleep. Visit FastMed Urgent Care, where we strive to provide our patients with high-quality and compassionate medical care. Cluster headaches are headaches that occur in patterns or clusters. They are one of the most painful types of headache and occur one to three times per day during a cluster period, which may last two weeks to three months. 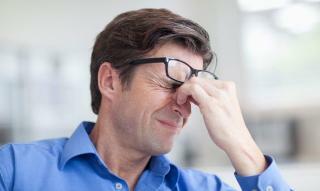 The headaches may disappear completely for months or years, only to recur. Although cluster headaches are extremely painful, they are not typically life-threatening and can usually be treated with medications, injections, or oxygen treatments. If headaches behind your eye are keeping you up at night, come to FastMed Urgent Care. With our extended hours, we make it easy for you to receive the treatment you need as soon as your headache occurs. For more information on headaches, or for any other health related questions, check out our Health Resources Center.